The Unification of Italy may have taken place 154 years ago, but that certainly doesn’t stop Italians from hating other Italians. The conflict is, of course, not just one that is not just unique to Italy: north against south. In Europe as a whole, a supposedly more civilised north despises and looks down on the more passionate, chaotic south. Just look at how the Greek national debt crisis is being handled by newspapers – and sometimes even politicians – in Germany. We all know the stereotypes – siesta-loving, late-dining, early-retiring southerners and hard-working, efficient and ever punctual northerners. In Italy though, this conflict has been taken so far that some groups such as political party Lega Nord are calling for the separation of the country. Why is it that the north and south of Italy hate each other so much they’d rather be completely different states? What makes Rome and Milan so irreconcilably different as to make them notorious rivals? The traffic in Rome is unforgettable, the cacophony of klaxons and vulgar language still ringing in your ears days after. People ruthlessly trying to cut ahead of you in any possible way, the law is a thing of the past. The famous Italian writer Niccolò Ammaniti suggested that Rome should be sprinkled with tranquilisers, as everyone always seems to be in a rush for no apparent reason. If you are looking to toughen yourself up whilst simultaneously broadening your Italian vocabulary, spend an hour or so in Roman traffic and you will truly understand the meaning of road rage and pure aggression – and learn some of the more colourful curses the Italian language has to offer. A personal favourite among these is the typical Roman obscenity: “mortacci tua”. In saying this you are effectively cursing all the dead ancestors of your enemy. You’d think this kind of heavy curse was saved for a life-long arch-nemesis – and I suppose that is exactly what all other cars, pedestrians, mopeds and any other form of transport in your way is when you’re on a road in Rome. Roman public transport is an equally exasperating experience. With only two underground lines, Linea A and Linea B, and trains not fitted out with air conditioning, travelling without a car in the summer can be a suffocating experience. The alternative of the bus is no better. Expect up to two-hour delays, while you wait in the scorching Roman sun, cursing the day you were too lazy to get that driving licence. Milan, on the other hand, is renowned for its efficiency and organisation; a characteristic most people like to attribute to Milan’s having been under Austrian rule in the 19th century. With reliable public transport and considerably less traffic, Milan does certainly run more smoothly. In fact, the Milanese pride themselves on being more punctual and organised than the people of Rome. Poor creatures, woefully unprepared for the merciless Roman jungle. Milan is the epitome of glamour and class, home to the likes of Prada and La Scala. You will never be short of something luxurious and chic to do. The city is like a magnet for all designers, artists, photographers and models, and with the World Expo taking place there from May to October 2015, Milan will reach new heights of cultural variety and excellence. Even the streets of Milan are practically a catwalk; everyone impeccably dressed from head to toe, something which can either leave you dazzled or overwhelmingly intimidated. Annoying a Milanese is easy, especially for a Roman. Not being up to date with the trends is practically a capital offence in the eyes of the Milanese. Upon entry… well pretty much anywhere in Milan, your outfit will be scanned and glared at, then judged to see if it meets the exacting Milanese standards. Something an easy-going, all-accepting Roman will never understand. However, the top tip to annoy a Milanese is perhaps the most simple: merely say you are a Roma or Lazio fan! You would have to search every corner of the city to find a Milanese that isn’t a Milan or Inter fan, that wouldn’t fall into a trance-like state of shock and horror upon finding out that the person they were conversing with was a Roma or Lazio fan. The fast pace of lifestyle in Milan could not be more different to how the Romans live their lives. The way of life in the Italian capital is the emblematic La Dolce Vita lifestyle. You take your time and learn to savour every aspect of every day, from your morning espresso to your post-lunch nap. As lazy and unproductive as the city may seem to some people, Rome does even have many new start-ups and technologies, albeit with a fairly stress-free approach to working. Romans and Milanese could not be more proud of their respective cities, which is probably why they end up despising each other. 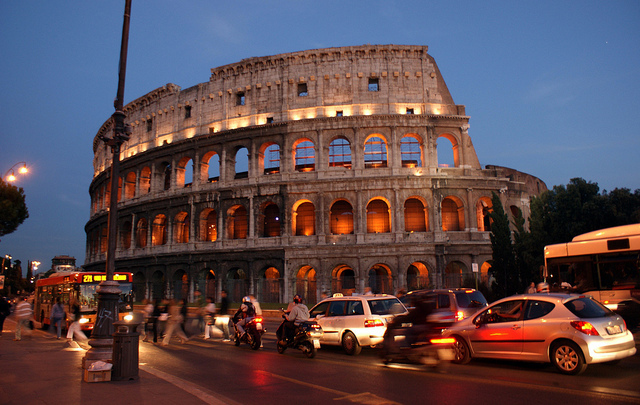 A Roman cannot fathom why anyone in the world would not adore Rome, a sentiment that has given rise to the saying that the most beautiful thing about Milan is the train back to Rome (la cosa più bella di Milano é er treno per tornà a Rome). For a Milanese the mere idea of considering putting any city before Milan is an absolute outrage! However, amidst the crowds of local patriots, there is the rare Milanese that craves Roman sunshine and humour, and upon his relocation to Rome dares NOT to view this as a tragic life event. Equally, the Roman who enjoys his stay in Milan, perhaps even to the extent of … moving there – cue gasps of shock and horror – , does exist, even if for Romans he is almost as much of a traitor as Brutus was to Caesar. What would Italy be without its confrontational rivalries? It is because of these fiery standoffs between cities such as Rome and Milan that Italians have become renowned for the venting of their emotions through gesticulating. The stereotypical snooty, glamorous Milanese and class-clown, friendly Roman disliking each other is all part of the Italian tradition! The more sophisticated north and a more passionate south being rivals is characteristic of Europe and can even be found in other countries such as France and Spain. These love-hate relationships are a distinguishing feature of our cultural variety. Europe may be one of the smallest continents in the world, but it is still one of the most diverse and if things in Italy are anything to go by, that’s certainly not going to change any time soon.